Captured at a fish market of a seaside restaurant. I think they look nice in B&W –shiny! We chose different kind of mussels that night. How do you like to eat your mussels? Ours was very simple; just boiled mussels with chili sauce. You seem to have caught a whole lot of very attractive jewels. They sparkle. I don't like shellfish, which is strange considering I've always lived close to the sea. Yours is a lovely detailed photo. 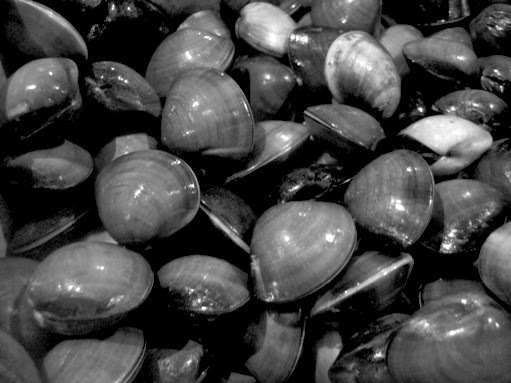 love the way you've caught the shine on the shells. Nice photo! I like them all different ways, but I most often eat them in marinara sauce. Oh, this is a absolutely brilliant photo! Great details! !